HDTV Supplys Wolfpack 10x12 Network HDMI Matrix Switcher is an easy to use HDMI video switching and distribution system that allows the design of multi-source to multi-video display systems using standard Ethernet cables. Because it is a matrix switcher, it allows any input to be routed to any output; or the same input to be routed to all outputs, or any combination. It is controlled by a PC or MAC via its LAN port with the supplied Browser Based WEB GUI and optionally via a WEB GUI on a cascaded wireless Router. HDTV Supplys Wolfpack HDMI over IP products, like this one, lets you create 1080p HDMI matrix systems using a dedicated Gigabit network and CAT-5e/6 cabling. 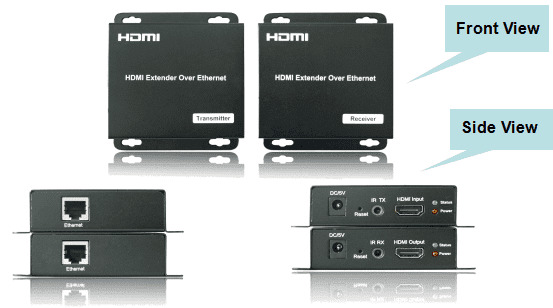 Many combinations of HDMI inputs and HDMI outputs is possible that can be easily expanded for additional HDMI sources and HDMI TVs and projectors given ports are available on the Gigabit Ethernet switch. Our Wolfpack 10x12 Network HDMI Matrix Switch is a pre-configured matrix switch using 10 - Transmitters and 12 - Receivers and our 24 - port Ethernet Switch. It uses CAT 5e/6 cables and a Gigabit Ethernet LAN switch with MJPEG techniques and an industry standard IP protocol to deliver 1080p video from sources that are 300 feet away from the Ethernet switch and another 300 feet away to the TVs. It also allows the system to grow in the field as its design allows you the flexibility of adding more video sources or more displays to the system based upon the number of unused Ethernet ports available. Multicasting and broadcasting architecture, adding more displays without adding LAN bandwidth loading . 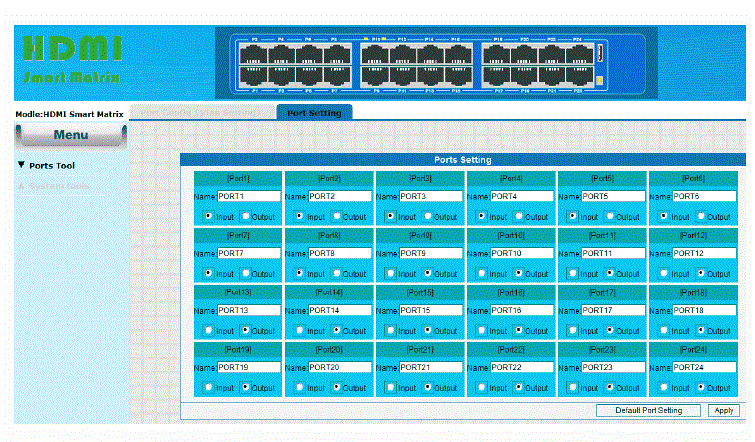 Supports Point-to-Point, Point-to-Many and Many-to-Many network configurations. 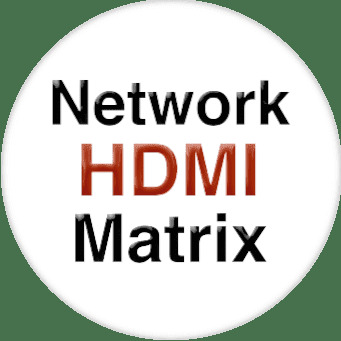 NOTE: This Network Matrix comes with HDMI Transmitters and HDMI Receivers and each of them needs the IP address to be setup based upon your needs. The MAC address also needs to be setup based upon your unique system configuration. Please see the above VIDEOS on how to do it. Why not buy this 10x12 Network HDMI Matrix Switcher today? Supports default configuration which can be restored to overwrite the current configuration which is working on via Web GUI and Reset button of the switch. Supports user management and limits one user to login. Full-duplex flow control (IEEE802.3x) and half-duplex backpressure. Supports Unknown Unicast / Broadcast / Multicast Storm Control. The base model of this 10x12 Network HDMI Matrix Switch is at WolfPack Network HDMI Matrix Switchers. HDTV Supply has this HDMI Network switch in stock in our California warehouse so place your order at the above ADD TO CART button by 11AM PST and it can ship today or call us at 800-841-9238 to place your order. See the below videos on how to setup your smart network matrix as well as controlling the various inputs being sent to various outputs. It also includes how to rename the inputs to what your devices are. Q: I don't see a picture, what do I do? A: Did you change the MAC addresses of the transmitters and receivers? Also in the switch do you have the ports setup to inputs and outputs? Q: I cannot get logged into the matrix switch. I've assigned an IP address as described in the instructions but cannot get the GUI to load on the browser. A: We have found Firefox works best to get to the GUI. Q: Does a HDMI Over IP Network Matrix come with a remote control or front panel switches? A: No, it is controlled by a PC or a MAC only via its LAN port or optionally wirelessly via the above Wireless WEB GUI Control option. Q: How do I wire it? Connect CAT5e or 6 cables to both the Ethernet of the transmitter and Ethernet port of the Receiver. (The cables must follow the standard of EIA-TIA 568B). Connect the IR TX receiving cables into IR TX port on the back panel and affix the emitter onto the source IR windows. HDTV Supply includes a 1 Year Limited Warranty on this 10x12 HDMI Matrix Switcher. The warranty states that (a) its products will perform substantially in accordance with the accompanying written materials for a period of 1 year from the date of receipt and (b) that the Product will be free from defects in materials & workmanship under normal use & service for a period of 1 year. In order to get a warranty replacement for a defective item, HDTV Supplys Support Team will verify the product is eligible for warranty. An RMA number will then be issued. Shipped replacements will be in like new conditions, tested and all components included. A 30-day RETURN also comes with this warranty. HDTV Supply also sells a 3 and 5 Year Extended Warranty for this 1x2 HDMI Matrix Switcher. Please go to Extended Warranties or see the above Options to purchase it.